This is not played like the traditional hot potato game; no music is required and no tossing is necessary. In fact, all you need is a pen, paper, brown paper bag and some children in need of a sight word vocabulary. 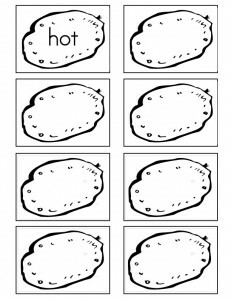 Use these templates if you have a list of sight words you would like to introduce to your child or students. 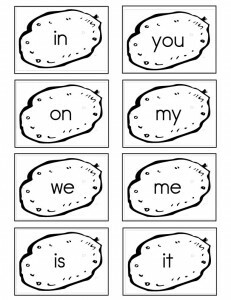 Use these templates if you have a child or students who are just learning sight words. The following high frequency words are commonly found in printed material: the, of, a, and & to. 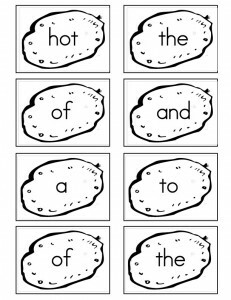 Use these templates if your child or student knows some sight words. The following words are commonly used by children in the primary grades: the, of, a, and, to, I, is, it, in, you, on, my, we, that & me. 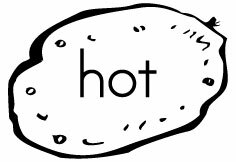 Prior to playing hot potato, review each sight word and if appropriate have a discussion about what is hot, e.g., stove, iron, coffee. If possible, have the children sit in a circle. Place all the sight word game cards in a brown paper bag. The youngest player goes first and begins by selecting a sight word game card. If he selects the hot potato card, his turn is over and he must put the hot potato card back in the bag. If a sight word card is drawn, she must read the word aloud. If she correctly reads the word, she keeps the card and passes the bag to the person to her right. The child with the most cards win. For added effect, consider coloring the hot potato red. This game can be played a number of ways. The hot potato can trigger different consequences. It can reverse the direction of the game or make a child put all previously won cards back in the bag. In addition, it can be played individually where the person with the most cards wins the game or it can be played as a group (my preference) to promote teamwork. The goal is to collectively gather the most cards. In addition, a child that is struggling with a word may ask someone to her right or left for assistance. The purpose of this game is to teach sight words so game play should promote automatic recognition of these words. Great idea!!! Students had a good time playing while learning and reviewing their sight words.